It’s not empty yet! Here, five delicious ways to use up every last little bit of peanut butter in the bottom of the jar. It's inevitable that every delicious jar of peanut butter will at some point come to an end. We've all found ourselves wondering what to do with that final spoonful—not quite enough for a PB&J, but too much to throw away. Next time, don't just spoon it straight into your mouth. Instead, try one of these easy but brilliant ideas for getting the most from every jar. 1. Peanut butter hot chocolate. Squeeze a generous amount of chocolate syrup into your almost-empty peanut butter jar and pour hot milk over the top. Stir until combined and serve with mini marshmallows. 2. Spicy peanut dressing. Make a one-jar meal by mixing this dressing in the jar first. Add to the peanut butter jar about a tablespoon each of soy sauce and rice wine vinegar (or lime juice) and a teaspoon each of sesame oil and hot sauce. Close the lid and shake the jar until the dressing is combined. Toss in some noodles, shredded carrots and lettuce, and enjoy! 3. Peanut butter chocolate shell. In a glass peanut butter jar, microwave 4 ounces white chocolate and 1 tablespoon of vegetable oil at 20-second intervals, stirring in between, until the chocolate is melted and the mixture is combined. Stir in a pinch of salt and let stand at room temperature until cooled. Serve the chocolate shell over ice cream. 4. 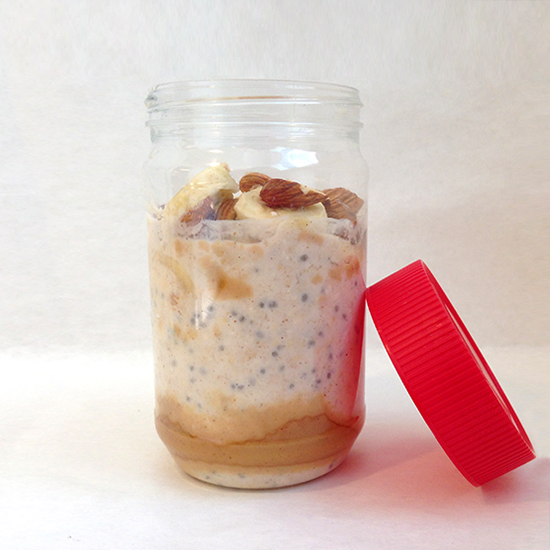 Banana-cinnamon overnight oats. Step up your overnight oat game by soaking them with the remainder of that peanut butter. You’ll get added flavor and extra protein as well. Mix 1/2 cup oats and 1/2 teaspoon ground cinnamon with 3/4 cup almond milk, 1/4 cup nonfat Greek yogurt and 1 teaspoon of chia seeds, and refrigerate overnight. Serve with banana slices and almonds. Stir and enjoy! 5. Peanut butter and chocolate–covered snack mix. This snack mix can be addicting, so it's smart to only make a small amount at a time. In a glass peanut butter jar, microwave a couple of tablespoons of semi-sweet chocolate chips at 20-second intervals, stirring in between, until the chocolate and peanut butter are melted. Add 1 cup of rice cereal to the jar, close the lid and shake until the cereal is completely coated. Remove the lid and add 1/4 cup of confectioners' sugar. Close the lid and shake until completely coated again. Now try to stop yourself from eating it all at once.